The rugged construction and extra-thick pump casing of our air driven diaphragm pumps stand up to the abuses of the most demanding sludge and slurry applications. 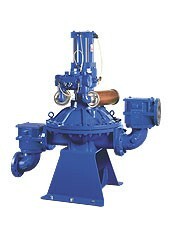 They overcome the "high-wear" problem commonly found in double diaphragm and other types of pumps. Ramparts pumps are capable of operating dry, on suction lifts up to 6.5 m and handling high solids content up to 70 percent. Pump stroke rate, discharge stroke time, suction drive pressure and discharge drive pressure can all be adjusted independently. Pumps will easily handle heavy sludges at their rate of accumulation in clarifiers and settling basins. Depending on the pump model you choose, our diaphragm pumps will handle solids up to 100mm in diameter. They are designed to handle heavy sludges and slurries in the most hostile environments; steel mills, paper mills, mines, chemical plants, food processing plants, refineries, municipal wastewater facilities and hundreds of other applications where other pumps strike out. The rugged construction and extra-thick pump casing of the pumps stand up to the abuses of the most demanding sludge and slurry applications. They overcome the "high wear" problem commonly found in double diaphragm and progressive cavity pumps. They are capable of operating dry, on suction lifts up to 6,5 meter, and handling high solids content up to approximately 70%. Our Air Driven Diaphragm pumps have only three moving parts so maintenance and service are minimal. Replacement of pump diaphragm can be accomplished in about one hour without disconnecting piping. Check valves can also be quickly and easily cleaned out using "twist lok" handles. No special tools required. Air is applied uniformly on top of the diaphragm which causes less resistance than spring-operated cylinders. This reduces stress on the diaphragm. The result is longer diaphragm life, reduced air consumption which saves thousands of dollars over the life of the pump, quieter operation and virtual elimination of muffler icing.